In a skillet, sauté onion, Roasted Bell Pepper Strips, garlic and olive oil. Add basil and garlic salt set aside. Cut bread into 1-in. slices and place on an ungreased baking sheet. Broil each side for 1-2 minutes or until lightly browned. Brush remaining oil on one side of bread. 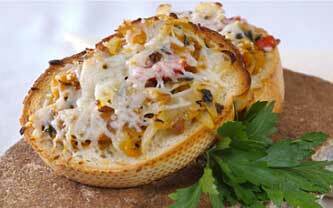 Top with pepper mixture and cheese. Broil for 2-3 minutes or until cheese is bubbly and your toasty appetizer is ready!